Schema Archimadrite Nektariy. Pascha, 2012. Mexico City - Beginning early Saturday morning and continuously over the course of eight hours, clerics of Holy Trinity Skete (Sagrado Skiti de la Santisima Trinidad) in Mexico City greeted dozens of families coming to have their kulichi, Paschal eggs, paschas, and traditional foods blessed, which they later shared with their friends and relatives. That evening, beginning at 8:00 PM, a line of those wishing to make their confessions had already formed. The faithful came from states like Coahuila, Michoacán, Morelos, Guanajuato, San Luis Potosí, Aguascalientes, Guadalajara (Jalisco), Nuevo León, the district of Mexico City, and others. Unable to fit into the little church, parishioners occupied every corner of the monastery: the church, the garden, the courtyard at the entrance, and even out on the street. 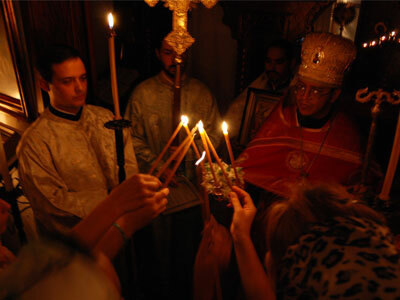 At midnight the procession, led by the clergy, exited the church into the monastery courtyard; the faithful, holding lit candles in their hands, occupied the whole sidewalk. Soon the bells began to peal and everyone sang aloud: “Christ is risen from the dead!” Paschal joy shone on the faces of adults and children, men and women alike; the celebration continued until three in the morning; most of those present received Holy Communion, and were given a Paschal egg as a gift. 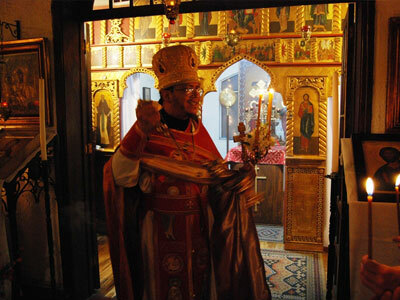 Dozens of the faithful remained until the end of the Divine Liturgy, afterwards partaking in the festal meal, which went on until 5:30 in the morning. Early Sunday morning, many came to the church that had been unable to take part in the Paschal All-Night Vigil. 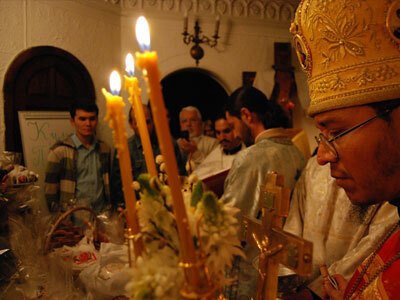 Midday Sunday, the clergy served Vespers. People continued arriving until 3:00 PM. The ambassadors of Russia, Georgia, Ukraine, and Serbia also took part in the feast. 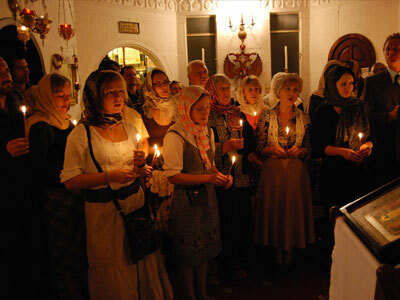 The Orthodox Mission here consists principally of believers from various states of the former USSR. To donate to the Holy Trinity Skete in Mexico City, please click here.